Gregoire partnered with Scott Barry Kaufman, a cognitive psychologist and the scientific director of the Imagination Institute at the University of Pennsylvania to give us a glimpse into the messy minds of creative people. And messy they are, as you know if you are a creative or hang with them. I found this book’s characterization of creative individuals spot-on with what I know and experience in the world. If you respond well to sound bites and revel in snappy, inspirational quotes, this is the book for you—it’s chock full of great content for speakers and social media mavens. That said, I would be remiss to reduce Wired to Create to a thing of “fluff”—it’s not—it’s thoughtful and research-backed. And unlike the 20th-century tomes on creativity I’m reading now, this book was created with an “everyman” reader in mind: it’s breezy, interesting, and delightfully digestible. 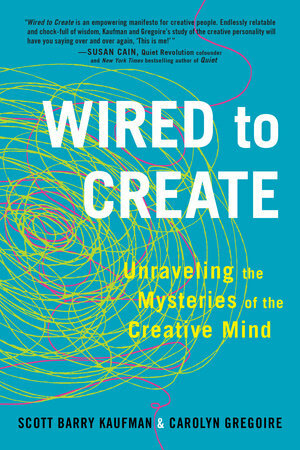 Wired to Create is structured into ten chapters—The Ten Things Highly Creative People Do Differently. Each chapter brings the “thing” to life through storytelling, research insights, and specific examples of creatives who exemplify a characteristic. At the outset, the authors debunk the linear four-stage model of creativity outlined by social psychologist, Graham Wallas (1. Preparation, 2. Incubation, 3. Illumination, and 4. Verification) as too simplistic. Instead, they adopt the perspective of Thomas Edison and others that “even at the level of genius, creativity is a ‘messy business’”—a multifaceted system of characteristics that ultimately converge. Creativity is “whole brain” thinking that isn’t relegated to the left or to the right. In my experience, creativity has a “multiplier effect.” In other words, injections of new creative inspirations into the messy creative mind stimulates further creativity over time—exponentially more. 1.	a phenomenon whereby a given change in a particular input, such as government spending, causes a larger change in an output, such as gross domestic product. 1. Plasticity – the tendency to explore and engage with novel ideas, objects, and scenarios. 2. Divergence – a nonconformist mindset and independent thinking. 3. Convergence – the ability to put in the hard effort necessary to exercise practicality and make ideas tenable. Individually and together, according to Kaufman and Gregoire, these qualities encourage the development of expression and creativity and come into play during two key phases in the creative process: idea generation and idea selection. Aside from living comfortably with complexity, what are the Ten Things Highly Creative People Do Differently? “Anything that is impractical can be play—it’s doing something other than what is necessary to continue living as an animal.” ~ Shigeru Miyamoto, creator of the Super Mario and The Legend of Zelda video game series. “That is the sound I want to make.” ~ distinguished cellist Jacqueline du Pre’s words at age 4 when she first heard the sound of a cello. Openness to experience goes hand in hand with integrative complexity, the capacity and desire to recognize new patterns and find links among seemingly pieces of information. Observation is an important driver of creativity. “There are always flowers for those who want to see them.” ~ Henri Matisse on the art of attention. According to one study, artists questioned said that a creative person is “one who takes risks and is willing to follow through on the consequences of those risks.” Businesspeople, meanwhile, responded that a creative person in the business world “is one who steers clear of the pitfalls of conventional ways of thinking.” Although what constitutes creativity differs across domains, creative people are united by their willingness to abide by unconventional ways of thinking and doing things. “The world in general disapproves of creativity.” Confused by this? Creativity is held up as a virtue in popular culture, right? Not so fast. Isaac Asimov, writer and professor of biochemistry, unpacks this by explaining, “the fact that we celebrate new and original ideas after they’ve become widely accepted doesn’t mean that we truly embrace creativity.” As a general rule, the authors assert, we don’t like things that challenge our habitual ways of thinking, which makes creative work a dangerous endeavor. Pick up this book. And while you’re at it, do something else: pick up another, utterly obscure book on creativity—one not endorsed by the “powers that be,” like this one is. If you haven’t already figured it out, what we (our culture) raises up as a creative work—as worthy, as culturally significant—are the works that have been reviewed and blessed by the experts in the domain. Rightfully so, one can expect that the Nobel Prizes, the Booker Prizes, and even The New York Times Best Sellers would be cherry-picked and promoted by the experts who hold the reins in the field. They’ve earned their stripes. Let’s give them that. But let’s not let them preclude us from looking outside of what has been accepted by the “inner circles”—the oddballs, the indies, the edgy, and the uncomfortable. If you want to be creative—if you want to think differently, if you want to be open to new ideas and experiences, explore the fringes too. Greatness can be found in all of the spaces around us—including those spaces where no spotlight will ever shine.